Description of "Art Of Strategic Sales"
As the size of business deals become larger, it becomes critical for the entire senior management to develop a sales centric mindset. 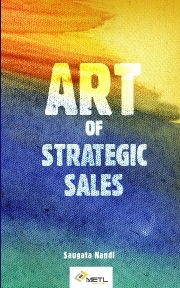 Art of Strategic Sales provides a strategic perspective to the critical discipline of Sales and differentiates it from the mindset of sales as a departmental function. Saugata Nandi is the Lead Consultant and Founder of METL. He has consulted extensively with over 75 organizations and has had insights into the way top leaders think. He is a management graduate and an engineer by profession and has been employed with organizations like Larsen & Toubro, NIS Sparta, Infosys Technologies - Infosys Leadership Institute and the Indian School of Business. He has extensive expertise across different industries and verticals and has held several critical management roles in organizations. Reviews of "Art Of Strategic Sales"